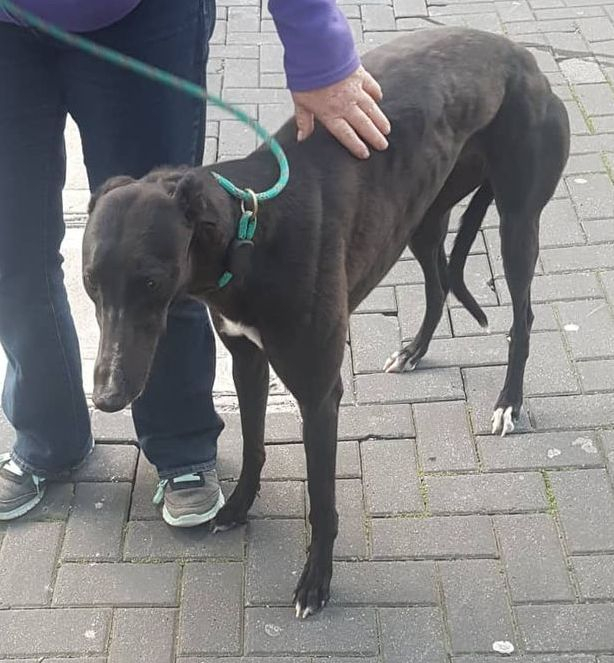 Hello, my name's Princess and I've come over from Ireland in a van on a big boat to look for a home with some humans of my very own. I'm quite a petite, dainty little girl with lovely glossy black fur which doesn't show up to its best advantage on the accompanying photograph. I also have some very discreet but flattering white markings which just set the black off a treat. I'm only two years old, so I have a lot of life ahead of me which I'm looking forward to spending in my own forever home with my own humans. They're lovely at the kennels, but I've heard so much about home life that I can hardly wait to try it. Do you think you might like to share your life with a pretty, affectionate greyhound like me. If so, get in touch to make an appointment to meet me - I'm really looking forward to it and I'm sure you'll be smitten straight away!